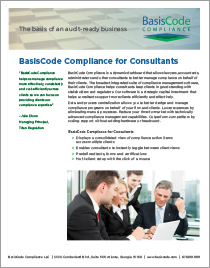 Our company meets the industry need for more integrated compliance technology tools that manage the lifecycle of your compliance program, from risk identification to mitigation. Our integrated compliance software increases process visibility and policy management control while decreasing the time spent managing tasks manually. 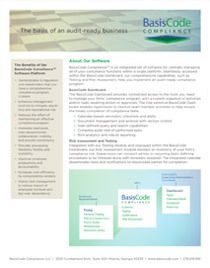 Seamlessly accessed from the BasisCode Dashboard, our comprehensive capabilities, such as compliance testing and compliance risk assessment, help you implement an audit-ready compliance program. 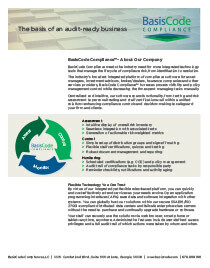 Our compliance Portal provides instant online access to engage your staff in maintaining a culture of compliance.